League One strugglers Millwall have sacked manager Willie Donachie. Donachie, 56, took charge in September 2006 with the Lions at the foot of the table and led them to mid-table safety. But a 4-0 weekend defeat at Carlisle left the Londoners at the bottom again. Veteran defender Richard Shaw will take temporary charge of the team. "This decision was taken with a heavy heart," executive deputy chairman Heather Rabbatts said. "We all love and deeply admire Willie Donachie." Former Scotland full-back Donachie worked as an assistant manager at Oldham, Everton, Sheffield Wednesday and Ipswich before replacing Nigel Spackman at the Millwall helm. "We were desperate for him to bring us the success he so craved," Rabbatts continued. "He will be greatly missed by us on a personal level but, as at the same stage last season, decisive action was necessary in the long term interests of the football club." 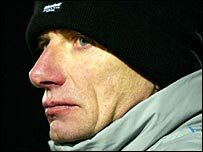 Millwall, who were a top-flight club in the late 1980s, have had a succession of managers in recent seasons, with four different bosses in 2005 alone.